Property, auto and worker’s compensation are the most vulnerable to fraud, according to the FICO Insurance Fraud Survey Highlights 2013. 57% anticipate an increase in personal property fraud by individual policyholders. Around 58% said the same for personal auto insurance fraud, and 69% expect a rise in workers’ compensation fraud. With the increase in fraud, comes the increase in costs. In the same survey, FICO reported more than 30.5% of the participants pegged the loss rate between 10% and 20%. To combat this growth and fight back on fraudulent claims, insurers can put a variety of programs in place. One useful tactic is establishing and managing a fraud hotline. By leveraging the collective knowledge of the public, insurers can extend their eyes and ears further than before. 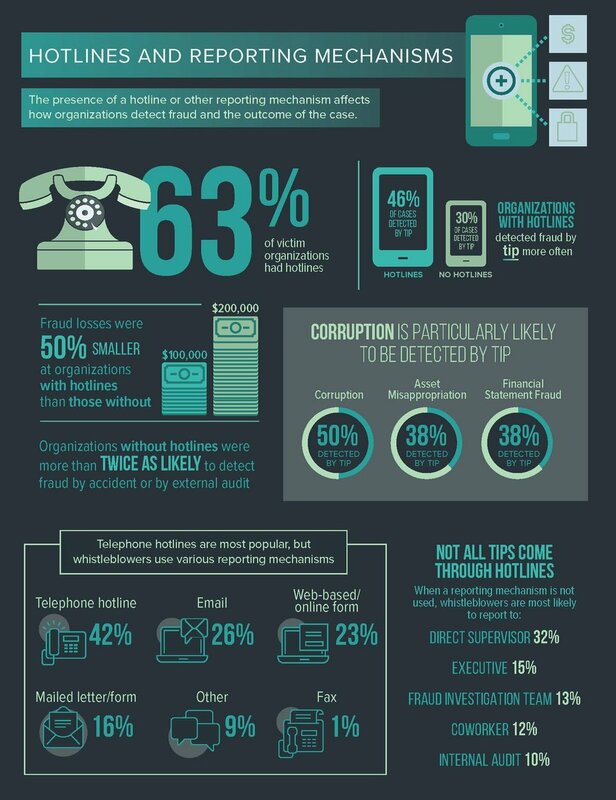 According to the Association of Certified Fraud Examiners (ACFE), 46% of cases were detected through tips in organizations that had established a fraud hotline. 42% of organizations with an established hotline use telephone, but other methods of reporting are made available such as email, online forms, mailed letters or forms, and even fax. Let’s look at some real world examples. In one case, an independent insurance agent was reported as submitting claims for vehicle repairs that were not legitimate. For the legitimate repair claims, they were found to be padding the bill and splitting the overage with the body shop they were working with. Without the tipsters’ insight into the agents’ behavior, it could have gone unnoticed. Sometimes the tipster may be the person was involved in the initial planning. For example, one tipster was part of a scheme with her friend to damage her car and then report a claim. The plan started with only one vehicle on a policy being damaged but escalated to the tipster's vehicle being damaged as well. As a result, the tipster reported her friend and the plan they had dreamed up implicating two other people in the process. Even understanding the value of this useful tactic, as the hotline is, some insurers still do not have their own setup. The Robison Group has experience working to establish several hotlines and has found the key is to keep it simple. “Establish a webpage that is easy to find, and a phone number users can call. Using strong call to actions, encourage users to report suspected fraud and give them the reason why - to keep their insurance costs down,” says Pat Burke, Chief Strategic Officer. A tip is submitted either via voicemail or online web form submission. Details are recorded or transcribed. If the claim is not found to be with the insurance carrier the tip was reported to, efforts are made to identify the insurer in ISO. All efforts are made to identify where the claim resides. The Robison Group puts together a report to submit to the insurance carrier and helps to develop a strategy based on the information that has been collected. If applicable, we will work with law enforcement or the state fraud bureau to further investigate. Once the process is in place, insurers need to notify their agents and their insureds of its availability. Public awareness can include posters for agent offices, links in email signatures, or even a special awareness week on social media: think International Fraud Awareness Week November 11-17, 2018. Allow and promote the ability of tipsters to remain anonymous. The tipster may want to avoid retaliation. If you receive permission to contact the tipster, develop a relationship with them. In many cases, developing a relationship with the tipster can result in them doing a great deal of investigative work, perhaps by providing event attendance and dates where the claimant may have been. Be quick to respond. Connect with the tipster while they are still hot either by return phone call or email. Having a robust fraud hotline system in our experience results in better stewardship to shareholders and to insureds, Shareholders earn more on their investments, while insureds pay less in premiums. But it also promotes doing the right thing.